Certified by the Carpet and Rug Institute of America, Jake’s Carpet and Upholstery Cleaning has been in business since 2012. Typically, when you call Jake you get Jake. Which means you’re getting a professional who truly cares about the integrity of your home and the safety of your family from harsh chemicals and cleaning agents. Jake uses the Bane-Clene Carpet Cleaning System. It’s strong enough to thoroughly clean your carpet and upholstery, yet gentle enough to uphold the quality. We pair this system with green cleaning products, the safest choice for homes with pets and small children. 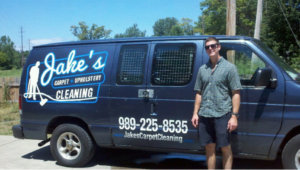 Jake has completed and maintains additional training to be constantly updated and knowledgeable on the technology of advanced carpet fibers and how to properly clean them to extend the life of the fibers. Jake aims to exceed your expectations… always. We believe in quality service and customer satisfaction. We never leave a project until we’re proud to put Jake’s name on it, meaning we take our time on task. Quality work and safety of our clients are top priorities.